An ancient Jain sculpture of Vimalnatha from Ambajogai, Marathwada region. Jainism had been enjoying imperial patronage in modern Maharashtra province since the ancient time. Earlier Chalukya, Rashtrakootas, Western Chalukya, Haihayas and Yadavas rendered many archaeologically important monuments, pilgrimage center and legacy concerned to Jainism in Karnataka- Maharashtra. History of Yadavas :- Yadavas of Devgiri are historically important figures in history of Maharashtra. Some of the sovereigns of this dynasty were adherent to non violent creed Jainism. Initial Yadavas of Maharashtra were feudatories of Rashtrakootas and Western Chalukya Kingdom but after gradual declination of Western Chalukyas in this region rendered an opportunity to Yadavas to proclaim themselves as independent sovereigns in 12th century. Initial Yadavas were followers and patrons of Jainism. Anjaneri near Nasik is speculated as origin place of Yadavas and some scholar believes that these were originally from Karnataka and were Kannada speakers initially. An inscription of Seunadeva Mahasamanta of Yadav clan has record of endowment to a Chandraprabu Jain temple at Anjaneri. Anjaneri, Devigiri and Ambajogai have many Jain temples and relics hailed from Yadavas era. In later medieval period these Yadavas were renowned as Marathas who were patrons of Marathi language. A Jain temple constructed by Yadavas was converted and appropriated by Muslims at Devgiri fort which is also known as Daultabaad fort. Lakhojirao jadhav; father of Jijabai and grandfather of Shivaji was patron of Jain temple at Shirpur which is also known as “Antriksh Parshwanatha temple”. The temple was under supervision and control of Marathas till 19th century AD. Lakhojirao jadhav’s Army has many Jain chieftains in his army and house of Yadavas was vegetarian. Let us know about a Jain pilgrimage centre which is not only ancient but archaeologically important place of Yadavas era. Ambajogai :- Ambajogai town is situated in marathwada region of Maharashtra state which is reckoned for its historicity and archaeological monuments as cave temples and temples. The place is situated at 56 Kilometers from Latur district headquarter in north west direction where as it is about 95 kilometers from Beed district headquarter in south east direction. Ambajogai is 26 kilometers far from Parali town which is famous for Baidhyanath temple. Jain temple of Ambajogai :- Jain temple of Ambajogai is situated in the middle of the town. The temple is dedicated to 13th Jina savior Lord Vimalanatha. The temple has a small door which leads us to a porch containing entrances to Swetamber and Digamber Jain temple. Swetamber Jain temple’s entrance is on left wall of the porch whereas porch leads us to Digmaber Jain temple directly. Digmaber Jain temple has Sabhamandap which has an entrance to inner shrine which contains Ancient Jina images of Saviors. Inner shrine is not a big structure and vedis of principal Jina and other Jinas are protected from a glass chamber type structure. It seems that the temple has been gone through more than one renovation work since its beginning. 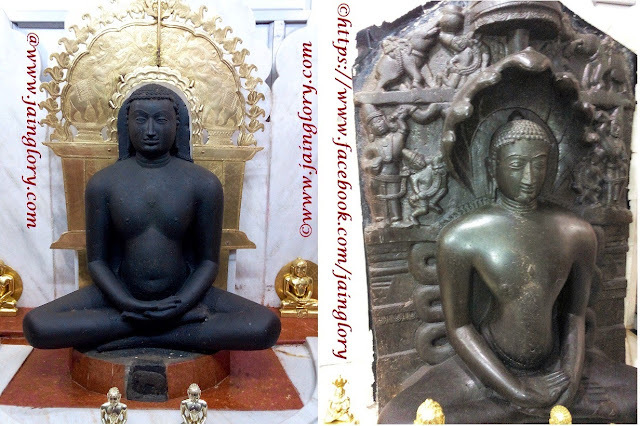 Inner shrine of Jain temple a main vedi containing three sculptures of Jina saviors in which middle sculpture is of Jina Vimalnatha who is venerated as 13th teerthankara in Jina creed. Lord Vimalnatha is celebrated here as principal deity of the temple and which is rarely found. Moreover, the sculpture of Vimalnatha is very mesmeric and sculpted from sandy stone but facial expressions of image is very alluring. Tranquility and serenity is depicted on face. The image is in Padmasana posture and does not contain Ashtha Pratiharya as temple is renovated many times and may be the sculpture was brought here from some other place. On the left side of Vimalnatha, a beautifully carved sculpture of 23rd Lord Parshwanatha is installed. The image is also as ancient as Principal one and delineated in Padmasana posture sculpted with sandy stone. The panel of Parshwanatha is very artistically carved with Chatra, Whisk bearers, Anointing Elephants and Vidhyadharas etc. Seven hood Cobra is depicted over the head of Jina whereas lord’s curly hair locks are spread till his shoulders. On the right side of Vimalnatha , a Kayotsarga Jina image is installed at main vedi. The sculpture is sculpted in sandy stone. The Jina image of kayotsarga teerthankar has about 3 feet height. There are other niches with Jina sculptures which contain sculptures of Panchmeru, Padmasana as well as Kayotsarga Jina teerthankars. A Jina sculpture with 24 teerthankars carved is installed at a niche. The image is also beautiful and mesmeric. The image seems contemporary to principal deity Vimalanatha. The temple has an erected sikhara on the temple which also contains a vedi with teerthankara sculpture. Jain temple of Ambajogai is adjacent to a Jain bhawan which has few 2-3 rooms and a hall which is generally used for abode of Jain ascetics. The temple is renowned as Atishay kshetra and has been developing with increasing media coverage. Historicity of Ambajogai :- Ambajogai has traces to Yadavas period and prior history of this city is not clearly mentioned in scriptures and inscriptions. The city has some historical monuments like Amba yogeshwari temple, Kholeshwar temple, Ganesh temple, Hathikhana caves, Jain caves, Nagzari teerth and Mukandraj temple. The scripture Yogeshwari Mahatmaya has an earlier record of a Jain king Jaitrapala who reigned over Ambajogai and territory. Ambajogai enjoyed capital city position during his reign and historians claimed him a Yadav sovereign of medieval era. A gadhi was erected to commemorate the Jaitrapala which is known as Jaitrapalachi gadhi or Shahburz. An inscription of Rashtrakoot or Parmar king Udayaditya is also found from Hathikhana cave which is hailed from 1066 AD.